Not everyone can afford to buy and install plastic windows. Therefore, some people prefer to repair old windows made of wood, believing that they will serve for some time. The main problem associated with their repair, is that the glass inserted into the window, over time, dry up and need to be replaced, and some may have broken. Going to the store to buy glass, a person can ask for help in cutting glass to specialists, and can carry out this process on their own. 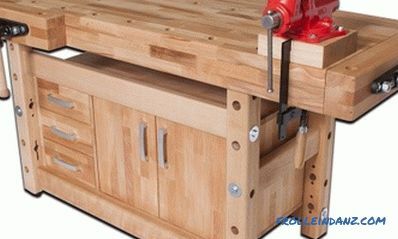 First, you should make the right measurements, that will allow us to cut off the piece we need just one time, without reworking it again and again. It would be nice to determine the exact dimensions to clear the frame of paint in a place in contact with the glass. After that, take a tape measure or a long ruler and measure the width and length of the area that needs to be glazed. Immediately cost to take into account one thing - it is best not to cut right next to it, but take a little less, about 0. 5 mm. This is necessary in case there are irregularities on the window. 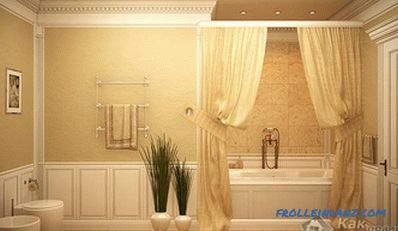 If there is a certainty that the window is good, then such a reserve can be avoided. 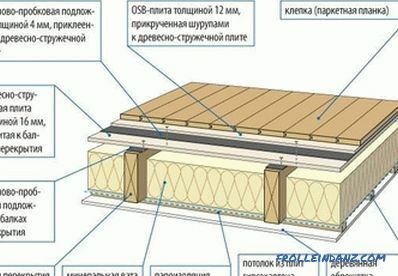 As a rule, a whole sheet which is acquired by a person, has a sufficiently large size, several meters in length and width, therefore, respectively, and has a lot of weight. In order to transfer such glass on a flat surface, you need two people. Yes, and be careful - do not hurt yourself when transporting glass. You can avoid cutting by wearing thick gloves or mittens, and also, as an option, by wrapping your hands with a piece of rag. The table on which glass will be cut should have a surface close to the ideal shape, not be dusty, no objects should rest on it. Otherwise, there is a risk that during cutting the glass will crack in the wrong place, and you may just have to throw it out. You can brush the table with a broom or brush the garbage with a rag, and only then put the sheet. Using a blunt tool, you can spend quite a lot of time cutting glass, if it ever works out. 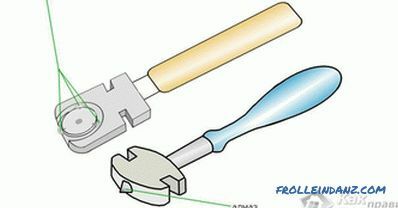 Yes Three types of glass cutters - diamond, roller and oil. Briefly about their advantages and disadvantages. Roller if necessary. As can be seen from the name of this glass cutter, the roller part is made of special rollers made from a cobalt-tungsten alloy that is famous for its strength. Oil - is almost the same as the roller one, but it is distinguished by the presence of the last bottle of oil, which is automatically fed to the glass during cutting. 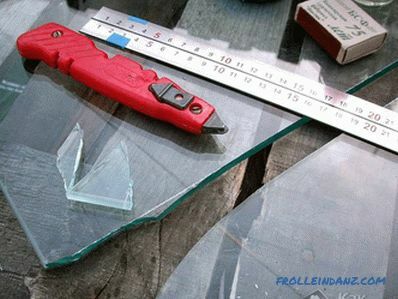 Experts usually use an oil glass cutter when you need to cut through a thick glass. 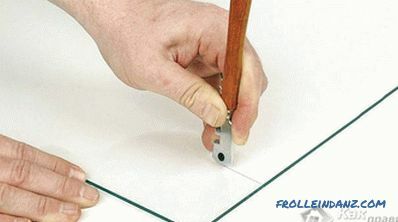 By selecting the glass cutter and placing the glass on the table, we mark on it the necessary sizes. It is rational to do this, trying to avoid large amounts of waste in the work. But, of course, they will still be. Attaching a flat rail or ruler to the labels on the glass, draw a line, but only once. A second attempt may result in a crack. We cut the glass gently, but carefully, applying a uniform force throughout the line. 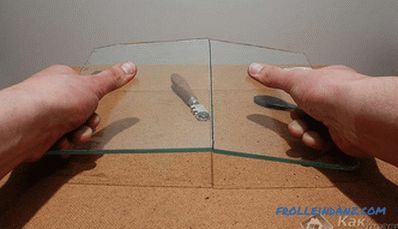 Cut the glass, gently move it to the edge and try to break it along the seam with a slight movement. It should be strictly on the edge, otherwise, again, you can incorrectly reverse the sheet. If it is not possible to break off, lightly tap on the seam with a glass cutter or pliers. 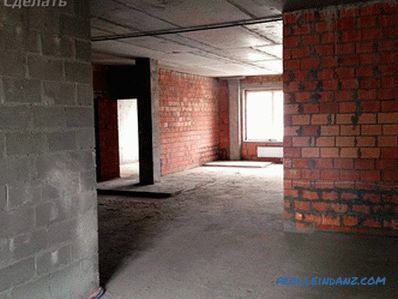 This is necessary in order to increase the crack in the place where the cutting was made. 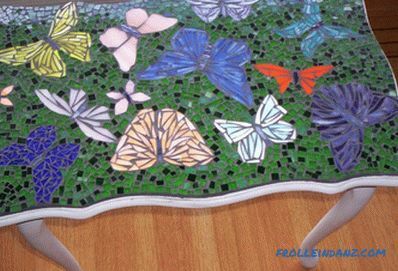 After cutting off the required piece, carefully remove it and set it aside, where it will not interfere with anyone, or immediately install it through the window. We find the frame we need and insert a cut piece of glass into it. It is important - it must be closed on the latch, otherwise a gust of wind can open it and loose glass will fall out. If the glass is not inserted due to some interference in the window frame, you can cut that place with a knife or a plane. Having dealt with this moment, we begin to fix the glass. Temporarily for fasteners, you can hammer on the center of all sides on one nail, but not to the end, as we do it temporarily. Cut the beadings according to the established dimensions, and for aesthetics, the corners of 45˚ are cut off at their edges so that the fasteners touch beautifully. We take out the temporary nails from the window one by one, starting from the bottom. We put the lower bead and nail it with small nails, trying not to hit them or with a hammer on the glass.Also independently install the upper bead, behind it - the side.